Ten Speed Press, 9781607747611, 304pp. Chefs Alexandra Raij and Eder Montero share more than one hundred recipes from Txikito—all inspired by the home cooking traditions of the Basque Country—that will change the way you cook in this much-anticipated and deeply personal debut. Whether it’s a perfectly ripe summer tomato served with just a few slivers of onion and a drizzle of olive oil, salt cod slowly poached in oil and topped with an emulsion of its own juices, or a handful of braised leeks scattered with chopped egg, Basque cooking is about celebrating humble ingredients by cooking them to exquisite perfection. Chefs Alexandra Raij and Eder Montero are masters of this art form, and their New York City restaurant Txikito is renowned for its revelatory preparations of simple ingredients. Dishes like Salt Cod in Pil Pil sauce have fewer than five ingredients yet will astonish you with their deeply layered textures and elegant flavors. By following Raij’s careful but encouraging instructions, you can even master Squid in Its Own Ink—a rite of passage for Basque home cooks, and another dish that will amaze you with its richness and complexity. 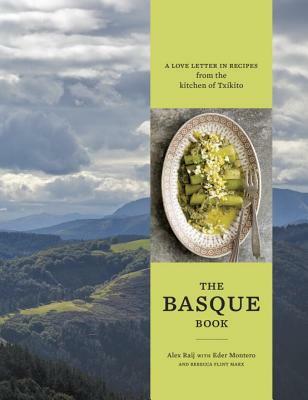 The Basque Book is a love letter: to the Basque Country, which inspired these recipes and continues to inspire top culinary minds from around the world; to ingredients high and low; and to the craft of cooking well. Read this book, make Basque food, learn to respect ingredients—and, quite simply, you will become a better cook. ALEXANDRA RAIJ and EDER MONTERO are the New York City–based chefs and owners of El Quinto Pino, La Vara, and Txikito, which was named one of the best new restaurants in the United States by Travel & Leisure. Raij was voted Eater New York’s 2012 Chef of the Year and has appeared on Iron Chef America, Food Curated, Foodography, and No Reservations. REBECCA FLINT MARX is a James Beard and IACP award–winning writer, and a senior editor at San Francisco magazine. "Dining at Alex Rajj and Eder Montero’s Txikito is like reading a love poem to the Basque Country, and their cookbook reflects that seamlessly." "The Basque Book: A Love Letter in Recipes from the Kitchen of Txikito is a gorgeous deep dive into the cooking of this very special region [... ] The book is jam-packed with lovely family stories, rich descriptions of the dishes—some familiar and some that will be very new to you—and excellent tips about what to look for when selecting ingredients, no matter how simple or complex a recipe may be." "This stellar collection offers 116 original, fresh recipes that without exception stimulate the taste buds and inspire cooks to rush into the kitchen. [...] Campfire trout, butterflied and baked with jamón ibérico and garlic, is simply wondrous, as is the paprika-marinated pork loin roast. Sweets and beverages round out this superb cookbook, an outstanding introduction to traditional Basque cuisine." "The recipes from this stunner come from a trio of New York City restaurants--Txikito, La Vara and El Quinto Pino--but reading it feels more like taking a trip to the Spanish countryside. As much a travelogue as it is a primer, it’s a perfect introduction to one of the world’s most ancient and interesting culinary traditions." "Packed with basics (e.g., poached eggs, mayonnaise, fish stock), pinxtos (small plates), seafood dishes, and more, the book will tempt seasoned cooks and armchair travelers. Part cookbook, part travelog, this richly descriptive title is a pleasure to read and recalls evocative, landscape photography-rich works." "Of course, the title is all it takes to seduce me—but so does this very handsome book. The only thing more difficult to translate than the Basque language is Basque cooking, and with The Basque Book, you will be able to eat it like a Basque. What could be better than that?" "Alex Raij and Eder Montero have created an ode to Basque cooking that's as intimate and approachable as their own kitchen. It's just as delicious, too—each recipe rich not only in flavor, but also in feeling." "The soul of a country is reflected in many of its most quotidian aspects, including its cooking. And Alex Raij and Eder Montero know this well—as well as they know how to cook. That's why this book is much more than a brilliant recipe collection filled with good ideas, techniques, or surprising flavors from two of the most successful Basque and New York chefs. It is a journey through the customs, landscapes, and history that have shaped one of the oldest and most enigmatic cultures of Europe, that of the Basque people." "It is a relief for a cookbook reviewer to find a cookbook written by chefs who successfully translated professional recipes into home kitchens. Alexandra Raij and Eder Montero did an admirable job in The Basque Book providing a large collection of excellent Basque recipes."